In this post we present more details about Scylla’s behavior during the benchmark behind these results. Scylla is all about performance and thus we decided to push metrics using collectd protocol.We sprinkled quite a few counters, which can be used to monitor its internals. Scylla can be configured to export them periodically to collectd. In our setup collectd was configured to further sent the events to riemann. and riemann-dash was used to monitor it. As explained in the architecture section, Scylla server is composed out of many shards as the number of cores. Those shards are internal objects, transparent for client-side tools. A shard is self-contained resource unit and owns a single cpu (thread), ram (NUMA local), own sstables and even its own NIC queue. The magic behind Scylla is to activate all shards in parallel, where the load distributed evenly over all shards. Those are exported by standard collectd plugins. 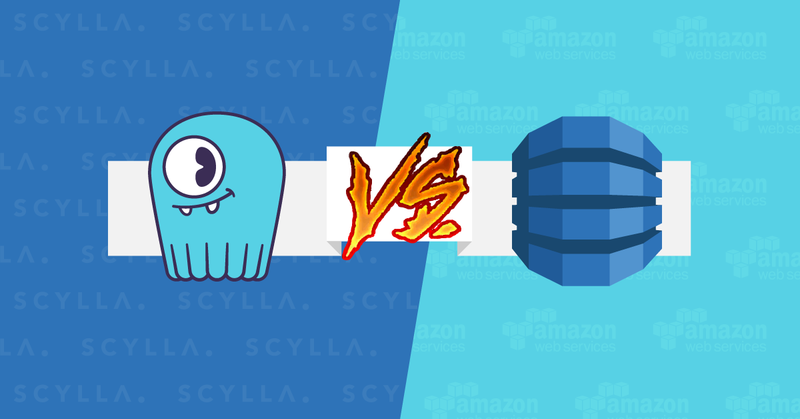 Scylla doesn’t depend on the system’s page cache for caching sstable data. Instead, it takes over the memory which in case of Cassandra would be dedicated for page cache and manages it on its own. We can monitor cache performance using counters, which will be demonstrated below. Scylla uses two memory allocators. One is the Seastar allocator, which is used for general purpose allocations. The other one is the log-structured allocator (LSA) which is used to allocate objects belonging to both memtable and cache. The graph in the bottom shows how the memory allocated by Scylla is divided. lsa/bytes-non_lsa_used_space (yellow) shows the amount of memory allocated using seastar allocator, lsa/bytes-total_space (blue) shows memory reserved for the LSA allocator. We can see that while the yellow part remains constant, the blue part grows up to 80GB, and then also flattens out. This is because as the database is populated, data is inserted into memtables and later moved to cache, both of which are managed by LSA. The flattening-out is because we hit the memory limit and can’t cache any more. On the middle graph we can see cache interactions. During the populating phase we see periodical spikes of cache/insertions. Those are flushed memtables moved into cache. On the top graph we can see which fraction of LSA memory (red line) is dedicated to cache (yellow/blue). We can see that it’s mostly cache. The saw-like shape is caused by writes to memtables. First we see that while the red curve rises monotonically, the yellow curve has a stair shape. That’s because memtables receive data in uniform fashion, but are flushed periodically causing a rise in the cache memory. When memory is full, cache entries get evicted to make room for memtable data. That’s why yellow curve has a saw-shape after the red one reaches plateau. The image below shows how Scylla behaves during the read workload over a 15 minute period. The Y axis represents CQL transactions per second. We can see how it does way beyond 1 million operations per second. We can clearly see that all or almost all requests are served from cache. From the cache activity graph (second from the top) we can see that we have no insertions but a lot of merges. This means that when data is moved from memtable to cache it is merged with existing partitions. That means we’re dealing with a workload with a lot of overwrites. From the top graph we can see that cache/bytes-used stays at the same level, while cache/bytes-total and lsa/bytes-total_space get perturbed by memtable applies and flushes. The “used” cache size stays at the same level because the working set fits in memory. We can see high write activity, which can be attributed to commit log and sstable flushes.